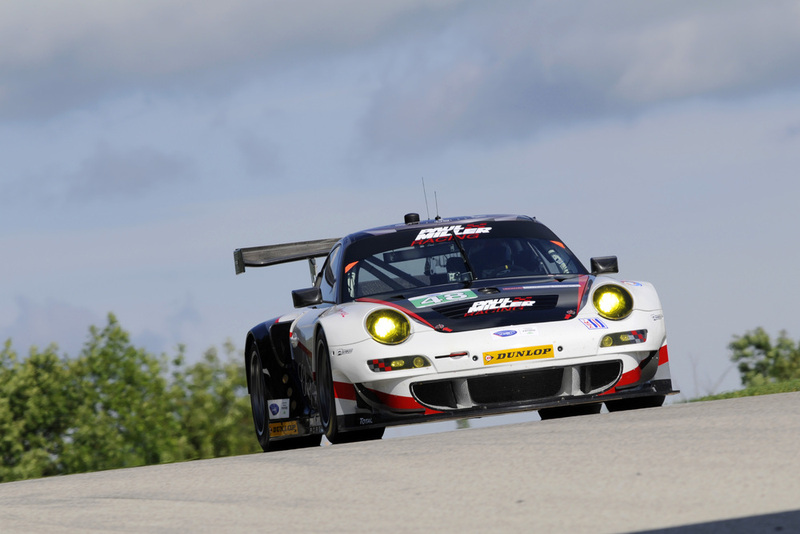 The Flying Lizard team put themselves in position to win this weekend with Marco Holzer qualifying the #44 Flying Lizard Porsche in P1 and Joerg Bergmeister driving the $45 in P2. Bergmeister was able to grab the lead from the start and held it for the next 45 minutes as he battled with his teammate Holzer, the No. 4 Corvette and the No. 55 BMW. The race was off to a great start. However, nearing the one-hour mark, the first full-course caution occurred just before both Lizard Porsches were scheduled to pit. Both the 55 and 56 BMWs, the No. 3 Corvette and the No. 01 ESM Ferrrari pitted just before this yellow. It was 15 minutes before the pits were open again and both Lizard Porsches and the No. 4 Corvette came in. This split the GT field in their pit sequence and proved to be a deciding factor in the race. The race was quite complex and a blast to watch. For a full recounting of the race and the deciding Pit stops, see the results and full release below our pictures. 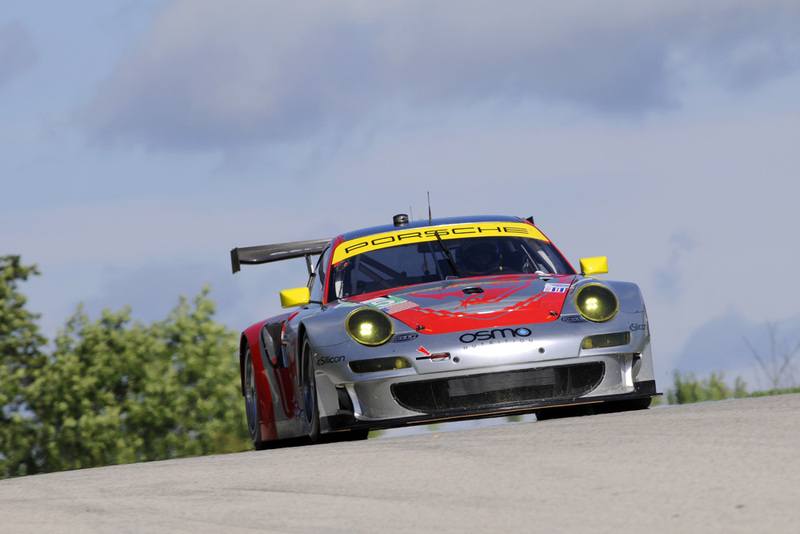 As always, feel free to visit our site at Porsche's Results and Pictures in the ALMS at Road America to view the pictures in our "lightbox" feature. The Lizard squad fought their way through heavy traffic, multiple full course cautions and some bad luck on caution timing to the third podium of the year. The No. 45 of Joerg Bergmeister and Patrick Long finished second in GT and the No. 44 of Seth Neiman and Marco Holzer finished eighth. Bergmeister started second on the GT grid in the No. 45 and Holzer was on the GT pole in the No. 44. Bergmeister took the lead at the start, Holzer moved to P2, the No. 4 Corvette was in third, and the No. 55 BMW in fourth. Over the next 45 minutes, the four lead GT cars stayed together, with Joerg holding the lead. 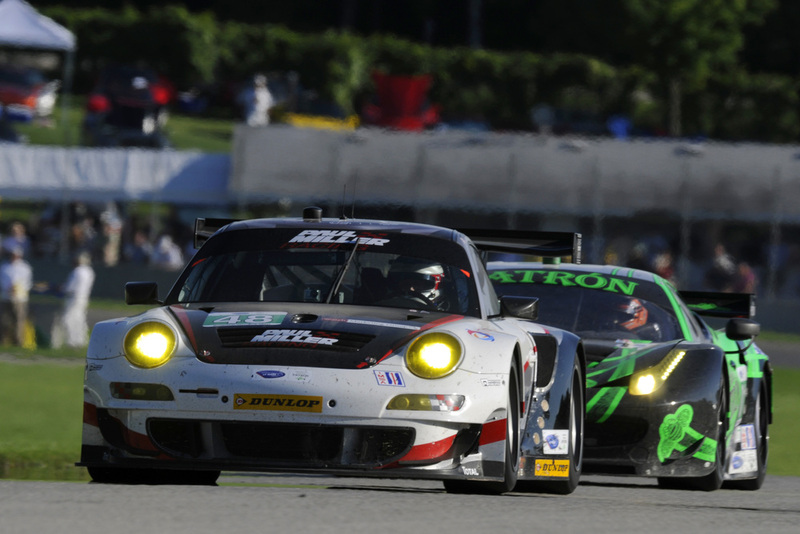 Nearing the one-hour mark, the first full-course caution occurred just before both Lizard Porsches were scheduled to pit. Both the 55 and 56 BMWs, the No. 3 Corvette and the No. 01 ESM Ferrrari had pitted just before the yellow. It was 15 minutes before the pits were open again and both Lizard Porsches and the No. 4 Corvette could pit. This split the GT field in their pit sequence and proved to be a deciding factor in the race. Once the pits opened under yellow, the No. 45 and 44 pitted simultaneously: Patrick Long took the wheel of the No. 45 and Marco Holzer stayed in the car. After the field resorted, Patrick was fourth, with the No. 56 BMW in the lead, the No. 3 Corvette P2, the No. 55 BMW P3, and the No. 4 Corvette P5. Holzer was P8. 1 hour and 40 minutes into the race, Patrick was able to overtake the No. 55 BMW to move into P3. Another full course caution sent the entire GT field back into the pits. Patrick Long stayed in the No. 45 for a double stint, Marco Holzer handed the wheel of the No. 44 over to Seth Neiman. A lightning fast pit stop and shorter fuel (because they had fueled later than the early-pitting GT group) shot the No. 45 up to the lead again. The No. 4 Corvette was now P3 and the No. 3 Corvette P4. With one hour left, the Lizards luck ran out when the No. 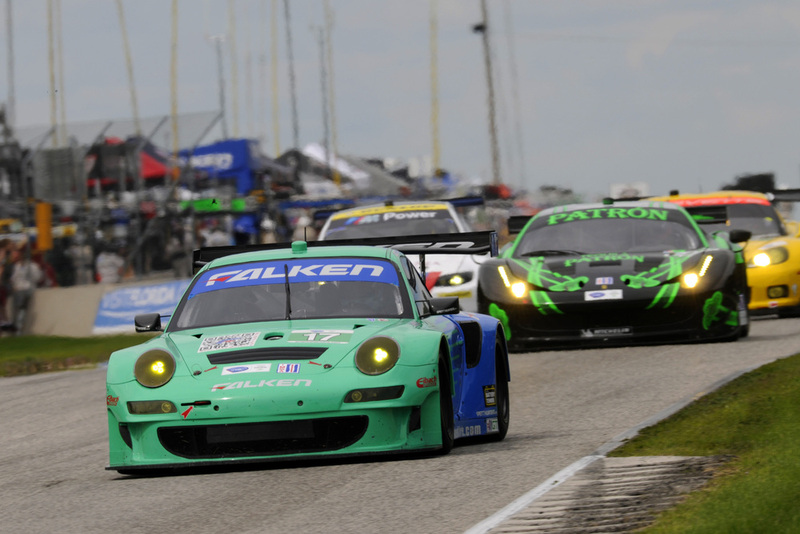 17 Falken Porsche impacted the tire wall, setting off a lengthy full-course caution. The early-pitting GT group had either just completed their stops or just made it into the pits before they closed under yellow. Both Lizard Porsches and both Corvettes finally pitted 20 minutes later when the pits opened. The No. 45, with Joerg Bergmeister behind the wheel made it out ahead of both Corvettes, but was now in P5. The No. 44, with Marco Holzer again behind the wheel was out in ninth. Just 10 minutes later, yet another 20 minute full course caution cut the race time down to just 18 minutes. At the restart from this caution, Joerg was P5, chasing the No. 3 Corvette in P4. The No. 55 was still in the lead, with the No. 56 in P2, and the No. 01 Extreme Ferrari in P3. Joerg was able to get by the No. 01 Ferrari and now in fourth. Marco was in ninth. Over the final 15 minutes of the race, the four lead GT cars ran closely together, threading through heavy traffic and being split by faster prototypes. With just minutes to the checkered, the No. 56 BMW--in P2--went wide, making contact with the No. 3 Corvette in P3 and Joerg was able to get by both cars to take second. On the final lap, Joerg had the No. 55 BMW in his sights but didn't have enough time to close the gap and settled for second place. The No. 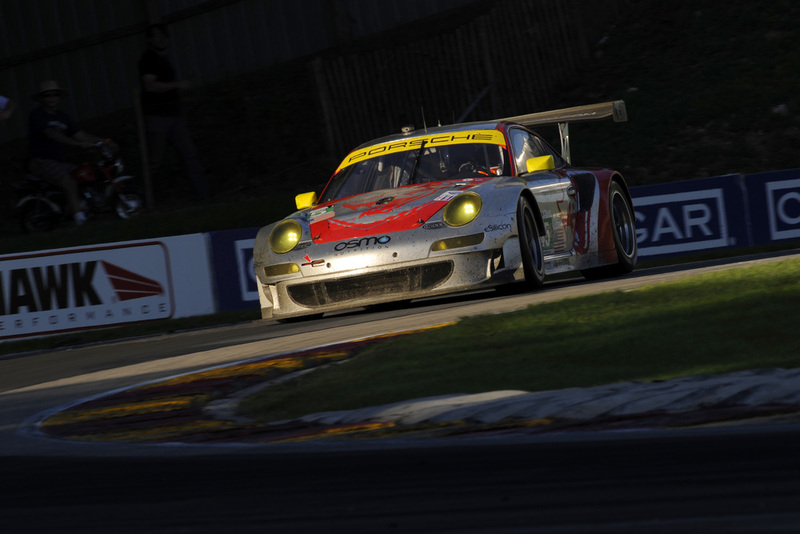 44 Porsche finished eighth in class. The No. 55 BMW won in GT. Up next for the Lizards is Baltimore, September 1, 2012. 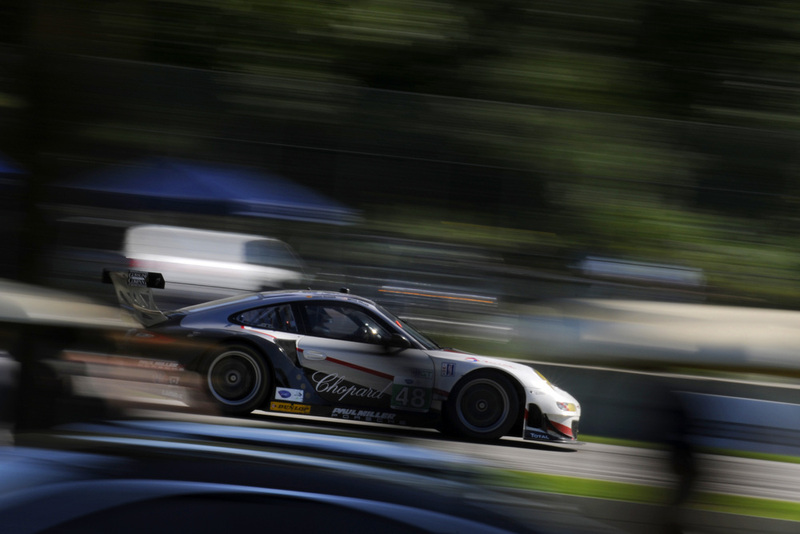 Holy Cow – I never realized there were so many ALMS races at Mid-Ohio – that’s surely a busy place in the summer!